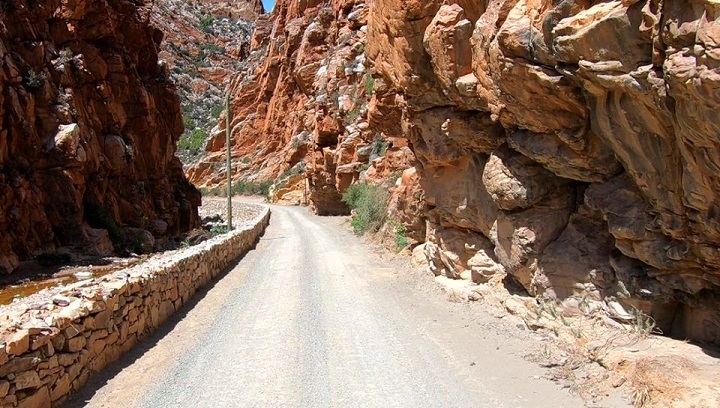 The damage from the April 2017 flash flood left this northern sector of the Swartberg Pass from Malvadraai through to the exit of the kloof completely devastated. What was originally scheduled to be an 18 month repair job, was achieved in half that time, with the pass being opened to traffic by November last year. There is only one short section of about 100m just north of Tweede Water that still needs repair work before the job is completed. The photo above was taken on the 11th February and the transformation from rock strewn devastation to this perfectly restored road is seriously impressive. Note the perfectly packed retaining walls (Thomas Bain style) where the modern 'padmakers' managed to rebuild the walls to look almost exactly like the original. In our news release today, we feature our brand new 7 part video series, filmed with the new GoPro6 in 1080HD with a stabiliser - the result is silky smooth footage which is a real pleasure to watch. We were able to dig up a lot more history on the pass, which is available via the soundtrack of the video set. Keep a look out for the 1919 Model T Ford in video #6. Enjoy guys. Talk again next week. The speedy repair is indeed impressive, especially given that it is not a slap-dash job, quite the opposite in fact. Still my favourite SA pass. Heres a picture of the entrance but facing the other way. Obviously before the repairs. I see there is a Mahindra parked there. Yours? Mooi job that on the pass.